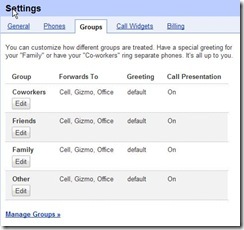 jRin.net » What is Google Voice, now that they’re fulfilling invites? What is Google Voice, now that they’re fulfilling invites? With Google Voice (formerly GrandCentral) starting to fullfill invites and hopefully opening to everyone soon, many people may not be entirely clear about just what exactly Google Voice is. I’ve written about it before in an earlier review when it first evolved from GrandCentral, but basically in a short, high level thought, it’s a (free) phone forwarding service — but of course, that just scratches the surface. What all can GV do for you? Well, to start out, what you get when you sign up is a new phone number (or, you can port your current number, if you so choose to). With this phone number, you would probably opt to give all your contacts this new number, setup different forwarding rules on your current phones (to forward to your GV#), so some combination of both. 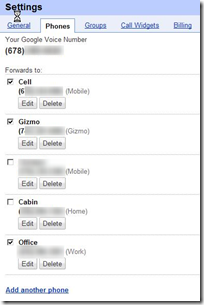 For example, if you have a bunch of contacts you have saved under the “Work” category, you can have all calls that come in from someone in there to be forwarded to your “Office” line – have all your contacts from the “Friends” category forwarded to your “Cell” – and then have unknown callers forwarded to all your phones, or perhaps straight to voicemail. Once a call is forwarded to one of your phones (cell, office, etc), once the call is answered, you must (by default, but can be changed) press “1” in order to accept the call – this is to handle the event that if the call gets forwarded to two different numbers (your cell and home) and someone from each location picks up the call, the first person to press “1” will actually receive the call. Besides voicemail transcription which I use GV heavily for, I also greatly rely on it’s ability to forward calls to my Gizmo number. 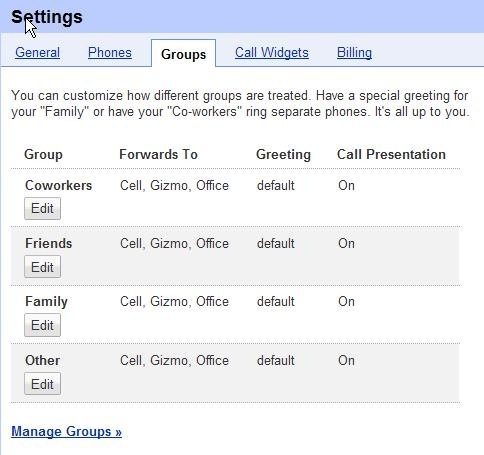 Basically, you can think of Gizmo as Skype – it’s a free computer based (ip) phone client which works on Windows, Mac, and Linux (as well as windows mobile and Nokia tablets) – and, as an added benefit, you can have one of the numbers that your GV# forwards to be your Gizmo number (for free)! While there are many implications for this, one that I use it for is to essentially forward my cell phone to my Gizmo (computer) number whenever my cell has no signal or has a dead battery. How do you do this? You’ll want to first setup your phone to forward your calls to your GV# whenever you are “unavailable” (meaning, the cell carrier cannot locate you either because you don’t have signal or because you phone is off/dead). 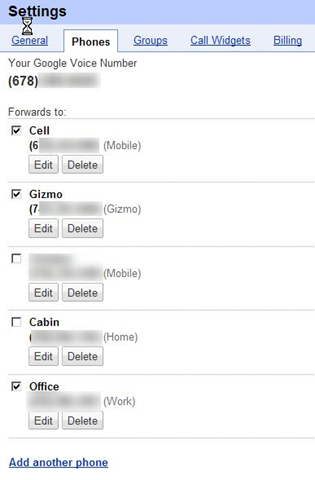 Then, in GV admin page, you’ll setup a call forwarding rule to forward calls to your Gizmo number. And now, whenever someone calls your cell and either it’s out of range or is dead, you will still get the call as it is essentially forwarded to your computer! Perfect for those who live in an area where cell reception is a bit shady! (however, this means you’ll either need to buy a USB phone, headset, or some other sort of microphone/speaker setup in order to actually talk to someone using your computer). 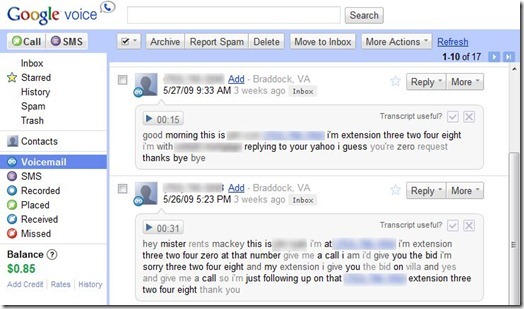 Google Voice is not a “phone”. If you call out from your cell/home/work number, the callee will not see your Google Voice number on their caller ID – so if you give out your GV#, if you call those people straight from your phone, they will not see your GV# but instead your “real” number. 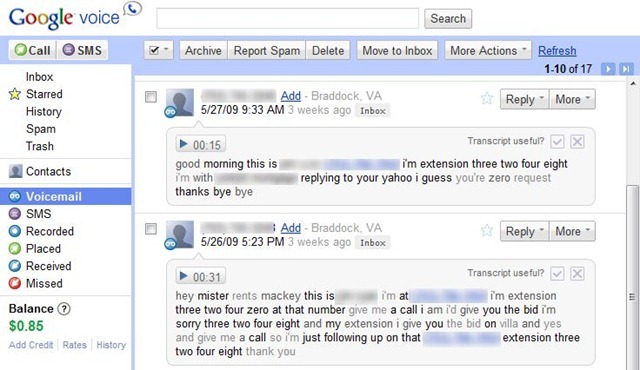 So basically, Google Voice cannot act as an actual “phone”, but rather is a very resource full tool. Good for giving out to people you may not want to know your “real” number (i.e. craigslist meets), or even to use as a backup incase you don’t get good signal at your home. Also, it’s a great way to try to move away from voicemail completely (by setting all calls to go to GV voicemail for transcriptions). 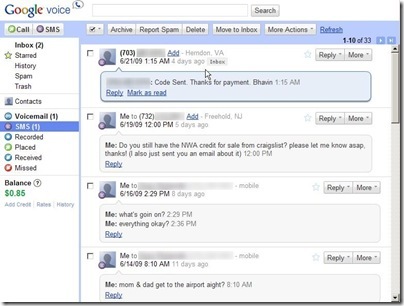 Have you signed up for Google Voice yet? Any tips/tricks you have discovered to be invaluable? Share in the comments!